“We are not just going to win sets, we will win matches.” Those were the assertive words of coach Japheth Munala in Malkia Striker’s final training session in Nairobi, just before leaving for the FIVB World Championship in Japan. 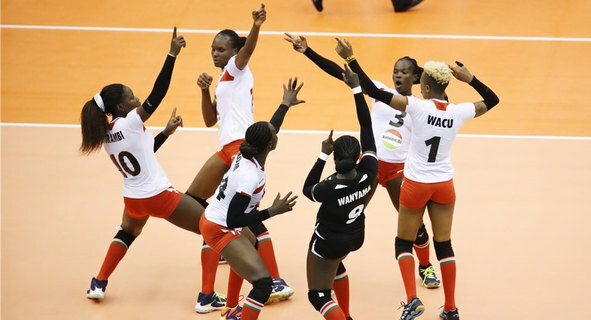 And the team did not mince their words as they started their campaign with a huge bang, winning their first ever World Championship match with a straight sets victory over Kazakhstan at the Hamamatsu Indoor Arena on Saturday afternoon. Malkia won in staright sets of 25-23, 25-22 and 25-21. Skipper Mercy Moim was in imperious form for Malkia picking up the highest number of points after accumulating 28 while Edith Wisa counted for 11 of the points Kenya picked. Wisa led the defense with four of her attempted 10 blocks being successful while Moim had four attempts, three of which were successful. Moim was in super form and attempted 42 spikes while Noel Murambi had 20 attempts with her ferocious right hand. Middle blocker Triza Atuka won three points off 15 serve attempts, stats that underlined just how determined the girls were. Kazakhstan’s highest point scorer was Sana Anarkulova who managed 13. Kazakhstan started the first set better, but Malkia kept them toe to toe before clinching the eventual score. The second set was a Malkia affair who led from the start though Kazakhstan kept them on their trail. The final set was competitive with the Asians trying to claw a set back and led 8-5 by the first technical time out. Malkia recoevered to lead 16-11 at the second and ultimately wheeled away to take victory.